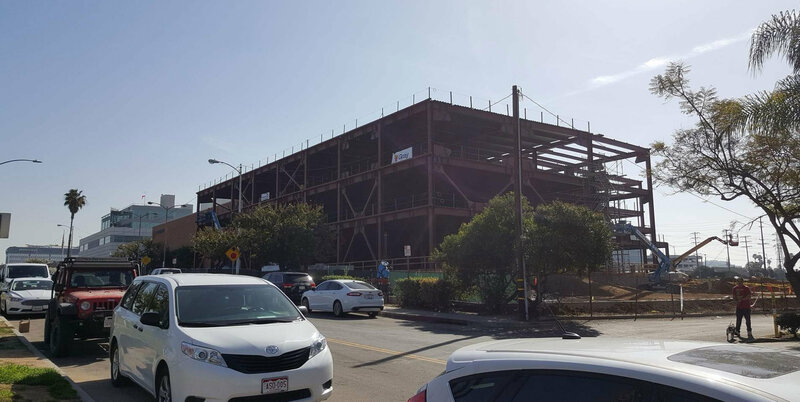 New building rises at 1700 E. Imperial Avenue. Aerospace giant Boeing is midway through an expansion of its existing offices in the City of El Segundo. The project, known as S50 West, consists of a three-story, approximately 97,000-square-foot structure which connects to an existing Boeing-owned building at 1700 E. Imperial Avenue. It is intended to house 158 Boeing employees, who will relocate from satellite offices in El Segundo at the time of the new building's opening. S50, which replaces surface parking, is portrayed as a nondescript low-rise structure in a 2015 rendering by architecture firm Stephen Woolley and Associates. A timeline for the project is not clear. Office space and hotels have dominated the development scene in El Segundo during the past several years, highlighted by the recent completion of a Hampton Inn east across Sepulveda Boulevard and an office conversion planned for a former Northrop Grumman facility.